Regain your confidence at the canter. Losing control at the canter is scary. If your horse has acted up at the canter by bucking or bolting it may take time as well as physical and mental preparation before you’ll feel confident riding this fast-paced gait again. Here, we’ll help you formulate a process to renew your confidence and work through your horse’s training challenges. You can return to cantering when you feel ready and know how to work through your horse’s bucks and kicks. If you are worried about riding your horse at the canter, give yourself a break. Take the time you need to improve your skills at the trot, and only canter again when you are ready. There is no law that says you must canter your horse each time you ride. Most riders feel pressure to canter, whether it’s a part of your chosen riding sport or for your horse’s usual conditioning routine. The important part is to not allow yourself to be pressured by others and to only begin cantering your horse again when you feel prepared. If you want to overcome your cantering challenges, read on for tips to help you relax and regain trust in your skills and your horse. 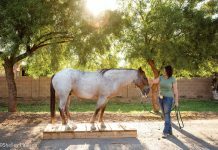 If you’re worried about the gait because of your horse’s behavior, I’ll provide tasks and strategies to help you be sure your horse will react well so that you don’t have to fear the gait. The best way to improve the canter is to improve the trot. Working at the trot will help you feel more confident when you decide to canter again. 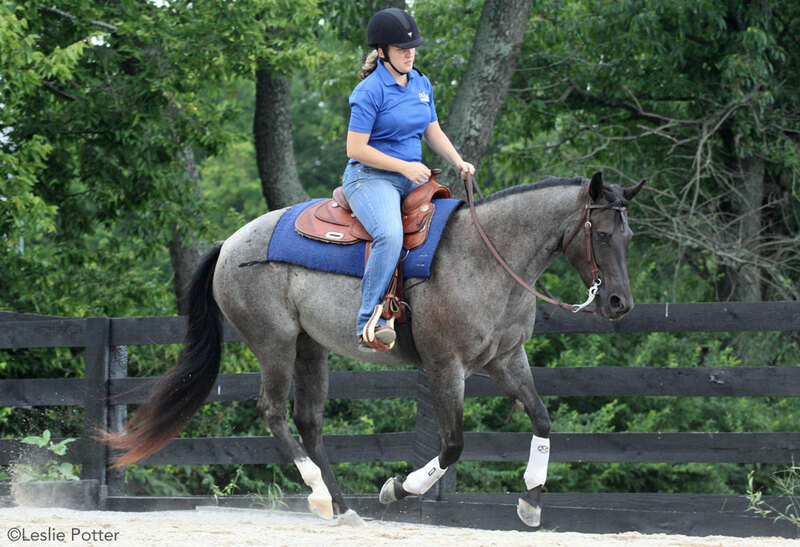 Work your horse at the trot without thinking of cantering. Plan your riding sessions and test your skills as you ride at the sitting and posting trot. Make sure you can speed up and ride at the working trot. Slow down your horse and ask for a collected trot. Ask your horse to trot circles, serpentines and figure-eights. As you work at the trot and test your skills, you’ll also help your horse tune in to you. As you trot circles and change directions, your horse has to listen for cues and respond quickly. You’ll gain confidence in your horse as you trust that he’ll listen to your cues and work in whatever pattern and at whatever speed you choose. If your horse is compliant at the trot, he should act the same at the canter. Your first goal may be to trot faster and do the same patterns with added speed. Make small goals then celebrate each step of progress—and don’t criticize yourself for not cantering. As you accomplish each small step, you will build confidence. Brake Check: If you know you can stop quickly from the trot, you’ll also be able to control and stop your horse when you’re cantering. To test your brakes, ask your horse to trot and to move in a long trot. Ask for a sudden stop by sitting down and back, saying “whoa” and using the reins in a one-two, left-right pull if needed. If you’re still worried about the canter, consider asking an instructor, trainer or accomplished rider to canter your horse first. No one can master horsemanship without help and guidance, and you may have a confidence boost when you see someone else successfully ride your horse’s canter. A horse can be reluctant to canter with a nervous rider who may pull at his mouth in a fear response as he steps into the canter. He’ll develop more confidence and understand that he’s supposed to move forward at the canter. 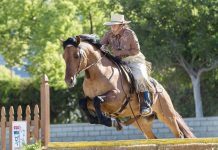 You’ll have more confidence in the horse when you see that he’ll move on without bucking, spooking or bolting. If you’ve become worried about the canter, it’s also a great idea for you to ride a seasoned school horse that will step into the canter with confidence. Take a lesson and make sure that you’re ready to release rein pressure and move into the canter with confident body posture. Many horses will “hump up” or crow hop if they don’t want to canter when cued, or if they receive conflicting signals from the rider. If a horse is a little lazy, he may express his displeasure by crow hopping when you ask him to canter. Often, a nervous rider will feel the hump in the horse’s back and immediately pull the horse back down to a slower gait. Horses are smart, and quickly learn the cause and effect of their behaviors. If they hump their backs, they learn that many riders will allow them to stop and rest. Some horses buck a little or toss their heads when asked to canter because the rider interferes with their forward progress. To start the canter, the horse must push his head down and toward the bit at the moment he steps into the canter. This is the same moment that worried riders tense up and pull back. The result is the horse slamming his mouth into the bit. He is punished for doing what he was asked to do. This undue punishment is frustrating to the horse, so he expresses his emotion with a little buck or head toss. Over time, the horse learns not to trust the rider and the rider no longer trusts horse. If you’re in this fear-producing cycle when you ask your horse to canter, it’s a great idea to get help from a skilled, confident rider. Have that friend or pro work at the canter to re-establish trust. If a horse offers to hump his back or buck, the right answer is to move him forward. Sit back and keep your arms and hands far forward so that you don’t interfere with the horse’s mouth at the canter. Only stop him when he relaxes his back and moves freely forward. If you only stop your horse when he is compliant and moving forward, he will be more inclined to act that way another time. If a horse has a long habit of bucking, it may take longer to create a new and better habit. Still, when the horse benefits, he learns quickly. So if the longtime bucker has to go round and round at the canter before he relaxes and gets to stop, it will make a big impression on him. If you feel confident at the trot, have received help for your horse’s behavior challenges and keep thinking about cantering, it’s time to add cantering back to your riding sessions. Make a riding plan to help stay calm and relaxed at the faster gait. Know where in the arena you will ask for the canter. Practice your canter cue sequence (see Part 1 in the April 2018 issue of Horse Illustrated) before you’re on the horse. Plan how far you’ll ride before asking the horse to stop. When you ask for the canter, sit back and make sure to reach your hands forward. The biggest mistake I see at the canter is when riders lean forward. This closes the angle of your pelvis and puts you in front of the motion. To move with the cantering motion, sit back as if you were pushing a swing. Keep this position in your mind to help reverse what nerves and fear can do. If you’re fearful, your tension causes your back to hollow and your hips to close and grip. Visualize keeping your nose behind your belt buckle. Your hips should make a circle as you canter, with your heels flexing down every stride. Only canter for a few strides then return to the trot. Stay on a straight line at first; cantering through turns is more challenging. Once you are cantering comfortably down the long side of the arena, set a goal to ride through the turn before returning to the trot. Make sure you reach forward as you turn (don’t pull back on the reins). Horses tend to break gait on the turns if you pull back with the turning rein or if you turn while using two reins. These rein moves seem like a cue for the downward transition and give your horse an excuse to stop. Once you can canter around a turn, then set a goal to canter the around the entire arena. If you add small goals and work toward them over many rides, you’ll find that you want to do more. Soon you’ll be cantering circles and making patterns—just like you accomplished while working at the trot. Take your time, be patient with yourself, and don’t forget to praise your horse for his willingness to work at the canter.